One Pull Design for Easy Application. 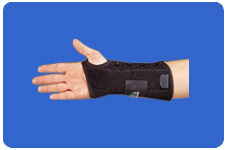 Provides excellent wrist stability and support. Constructed of soft, comfortable orthopedic felt laminated to brush nylon exterior. The adjustable pull and lacing system fastens with one hand. The anatomically contoured palmal stay is malleable for customization and removable for “step-down” rehabilitation. Universal size fits from 4½" - 9½" wrist circumference. 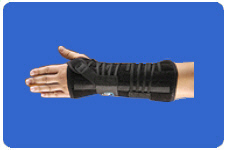 The Titan Wrist Lacing Orthosis is available in regular and long lengths. Dorsal range of motion can be controlled by changing the position of the dorsal stay pod. Move the stay pod distal to restrict dorsiflexion. Move the stay pod proximal for less dorsiflexion restriction. 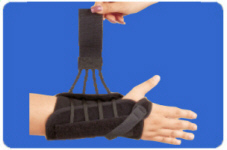 The brace fits below the palmar crease for full finger dexterity. The dorsal stay pod can be moved proximal or distal for desired level of dorsiflexion restriction. On small hands, the eyelets will clamshell over the laces for a smooth overlap.